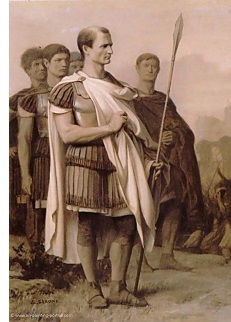 Gaius Julius Caesar (100-44 B.C.) - History's most famous Roman and the man most responsible for ending the Republic, Julius Caesar never wavered in, nor hid his goal to rule Rome. He was an unabashed member of the populares and displayed his ambition from an early age. Lucius Cornelius Sulla recognized it and regretted not having the young Caesar put to death when he had the opportunity; for he noted in his memoirs, "there are many a Marius in Caesar." But Caesar had powerful friends who were also allied with Sulla, and their lobbying on his behalf caused the dictator to hesitate, allowing Caesar to escape until the purges were completed. How did Caesar succeed where Pompey ultimately failed? Well, whereas both were military geniuses, Pompey was much less adept in the field of politics. He preferred to settle matters with the sword. Casaer, on the other hand, was nearly as skillful a politician as he was a general. He could flow from the battlefield to the Senate floor as easily as a chameleon can change backgrounds. For to Caesar, both were forms of combat. After his campaign in the East, Pompey should have been able to have his way with Rome. He had conquered more territory than any Roman before him. Caesar at that time had not yet conquered a thing. There is an account written by the Roman historian, Suetonius, that, while in Spain, Caesar saw a statue of Alexander the Great and wept. For he was already at an age where Alexander had conquered much of the known world, and he had accomplished relatively little by comparison. And yet, upon Pompey's glorious return to Rome in 62 B.C., Caesar found himself on nearly equal footing thanks to skillful political maneuvering. The formation of the First Triumvirate in 60 B.C. is a perfect example of Caesar's talent. He contrived of the whole idea and sold it as a way to reconcile the differences between Pompey and Crassus. Pompey bought it and unwittingly elevated Caesar in the process. With his political position secured, it was now Caesar's turn to conquer. He ran for and was elected consul in 59. Now the Roman Senate had to deal not only with Pompey's ambition, but Caesar's as well. It tried to appoint him governor over an already well established territory in central Italy, but Caesar used his influence to overturn the appointment and was given the northern most province of Cisalpine Gaul, bordering on the European frontier, along with four legions. He also managed to have his term extended to five years instead of the usual one. While in northern Italy, he raised two more legions on his own to bring his army up to six. Recall that his uncle, Marius, broke with Roman tradition and raised troops from the non-land owning class (see Marius). Caesar learned from this and decided to follow the same script. Employment in the military and the prospect for glory was more than enough incentive to attract the poor. In 58 B.C., he launched his campaign into Transalpine Gaul under the pretext of protecting the Republic's northern border, as well as coming to the aid Rome's southern Celtic allies, which were under duress from northern tribes. It was an unauthorized campaign; he did so without permission from the Senate. This threw Rome into political chaos. Caesar had done exactly what the Senate had feared, and it was powerless to stop him. The only person who could have conceivably done so is Pompey, and he and Caesar were allies at this time through marriage and the triumvirate. After two years, he had brought the entire region of Gaul under his control. But his governorship was running out and he had not yet finished his campaign. Acting unilaterally, he brought Crassus and Pompey to the northern town of Luca in 56 to re-affirm their alliance, as well as extend his consulship for another five years. This allowed him to resume his campaign, and he was ready to try something no Roman had ever done; cross the English Channel and invade Britian. The invasion in 55 appears to have been partially successful in that he was able to establish a beachhead, but did not penetrate very far inland. He returned a year later with greater success, but a revolt back in Gaul forced him to abandon Britian for good. 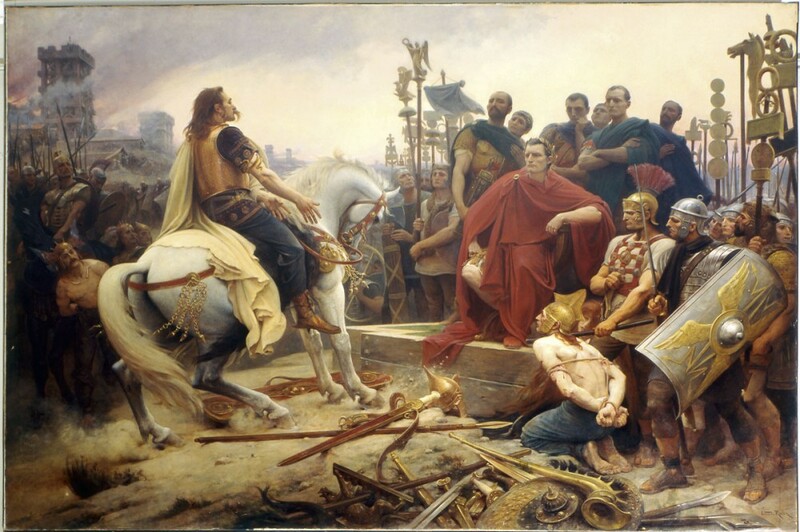 It should be noted that the chronicler of the Gallic campaign is Caesar himself. As a talented writer and master of self-promotion, he was well positioned to document his own exploits. Despite obvious biases and exaggeration of opposing numbers, his work is considered largely accurate. While in Britian in 54 B.C., Caesar's daughter and Pompey's wife, Julia, died in childbirth. This was the beginning of the unraveling of the triumvirate. The following year, Crassus, who was seeking his own military glory was killed in Parthia (see Battle of Carrhae). Meanwhile, the revolt in Gaul was led by a man who would prove to be one of Caesar's toughest opponents; Vercingetorix, a nobleman from the Celtic tribe of the Arverni. He offered the staunchest resistence of the campaign and threatened to ruin Caesar's plans to rule Rome. In their initial confrontation in 52 B.C., Vercingetorix beat Caesar at the Battle of Gergovia. However, Caesar was able to regroup and ultimately defeat him after a long Siege at Alesia later that same year. This marked the end of the Gallic campaign and the entire region was added to the Roman Republic. Caesar now had what he needed to execute his grand plan; military success and battle hardened troops. The Senate had anticipated his next move and ordered Caesar to disband his army and return to Rome, alone. Pompey also knew what he was up to and sided with the Senate. Caesar, for his part, thought he would be arrested and prosecuted for his unauthorized invasion of Gaul. In 49 B.C., he disregarded the Senate's order and crossed the Rubicon River (the southern border of his governorship) with one legion and the words, "the die is cast." (according to Plutarch). This move sparked a civil war which would last for four years and end in Caesar's total control of Rome (see Battle of Pharsalus). It was short-lived, however, as conspirators in the Senate led by Marcus Brutus and Gaius Cassius assassinated Caesar on the "Ides of March" in 44 B.C.. In a bit of historical irony, Caesar died beneath a statue of his great rival, Pompey.